Right at Home is having a new Instant Win Game. 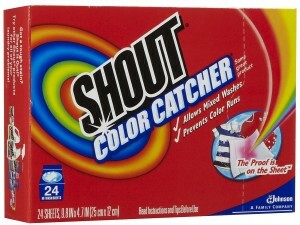 Enter to Win a Free Sample of Shout Color Catcher. Just head on over and fill in your information. You will know instantly if you won a Free Sample. You can enter 1x per day until February 9, so if you don’t Win today…try again tomorrow. Valid while supplies last…They will be giving away 5,000 packages. From their site: Shout® Color Catcher® sheets protect clothes against color bleeds so you can wash colors together—even whites—without worry.